Borderlands 2 was released just the other day and already DLCs are in the works. 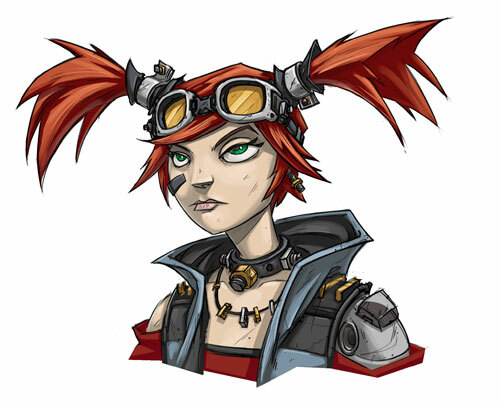 One will bring a brand new class to the table called Mechromancer (pictured here — the cyborg female named Gaige). This particular character is excellent for those who wish to play solo, as the skill tree provides users with the ability to call upon a robot partner dubbed “Death Trap” — who can fight alongside you and destroy enemies and tank OR who can support you and your team members with supplies such as ammo. This DLC will be available for download October 16th for Xbox 360, PlayStation 3 (PS3), and Windows PC. If you pre-ordered the game, then this character will come free. Otherwise, the DLC costs $9.99 via the XBL (Xbox Live Marketplace) or PSN (PlayStation Network store). Hurray for downloadable content! If you have errors with the game and want to fix them, check out Borderlands 2 Game Fixes AND our other Borderlands 2 Error and Windows 8 Launch Fix. Also check out Best Borderlands 2 Class if you need help choosing a class! This entry was posted	on Friday, September 21st, 2012 at 7:32 PM	and is filed under Games. You can follow any responses to this entry through the RSS 2.0 feed. You can leave a response, or trackback from your own site.